After b ackpacking through South America, moving house, renovating and enjoying a decent summer in Germany; here I am: back online with Tassenkuchen. Back to blogging and finally back to baking. And we have reason to celebrate. I have just passed the German baking exam and am proud to call myself ‘Konditor Meister in fach bereich Cupcakes’. I baked over 50 cupcakes for the test last week, a variety of all sorts of flavours, and was super proud when the Obermeister told me I had passed with flying colours. Some of my favourites are shown here – Double chocolate with pistachios, banana and lemon, cappucino. I decided to try a different kind of chocolate icing this week and opted for something other than the tradtional buttercream icing which is on so many cakes and in so many recipes. 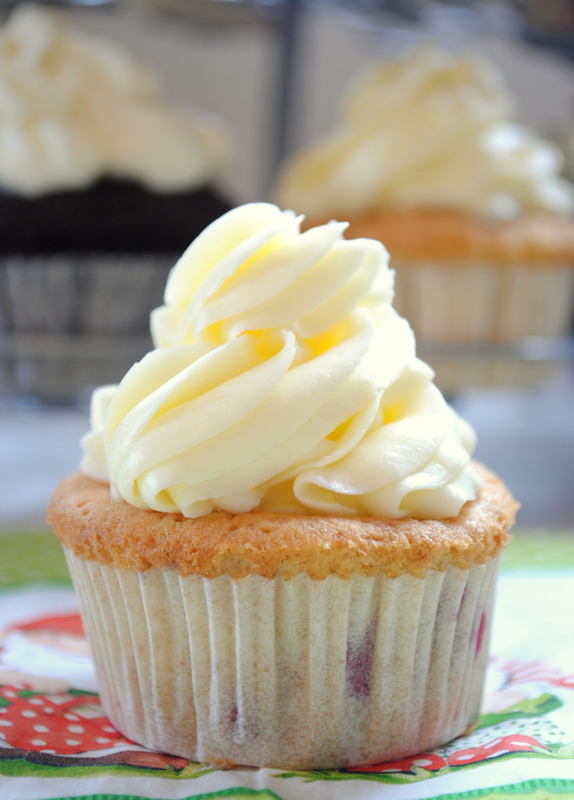 Cream cheese icing pairs so well with a moist carrot cake or lemon cupcakes, so there is no reason it shouldn’t pair well with a chocolate cupcake. 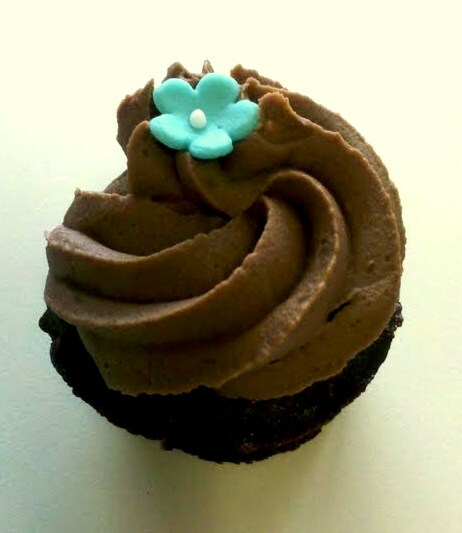 To start with, this mini cupcake is an extremely rich and dense chocolate base, almost like a brownie. 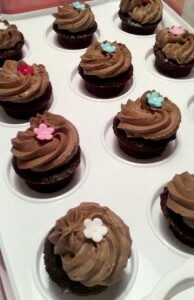 For the icing, I used cream cheese with powdered sugar and added real melted chocolate. I think that makes the difference. 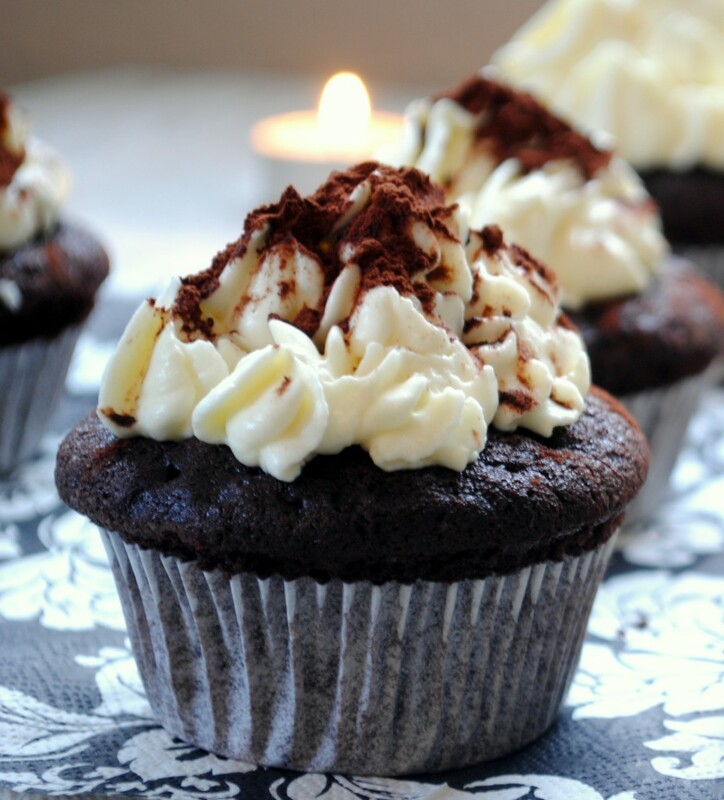 It’s rich in chocolate flavour and with the cream cheese, the taste is so different to the sweet buttercream taste. I made these last week to take in to the office. Well, by 9:30am, I couldn’t resist and indulged in the first one by myself (The first of three!). The bite sizes are such great portions and you don’t need to fuss with plates etc. 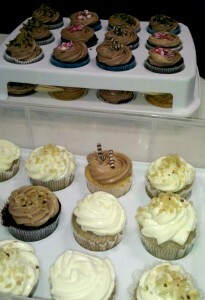 If you have a cool cupcake carrier like mine, it makes transporting the cupcakes so much easier. Plus the inside plastic portion comes free and makes a sort of tray function which is perfect for offering to your colleagues. This is by far my one of my favourite recipes. Stay tuned – I will share it in the next post so you can try these at home. I will be trying out different versions and adapting with different flavours over the next weeks. What is better than chocolate? Well that’s easy…MORE CHOCOLATE. 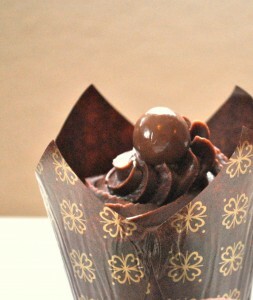 Chocolate upon chocolate – in my opinion there is nothing better than that. 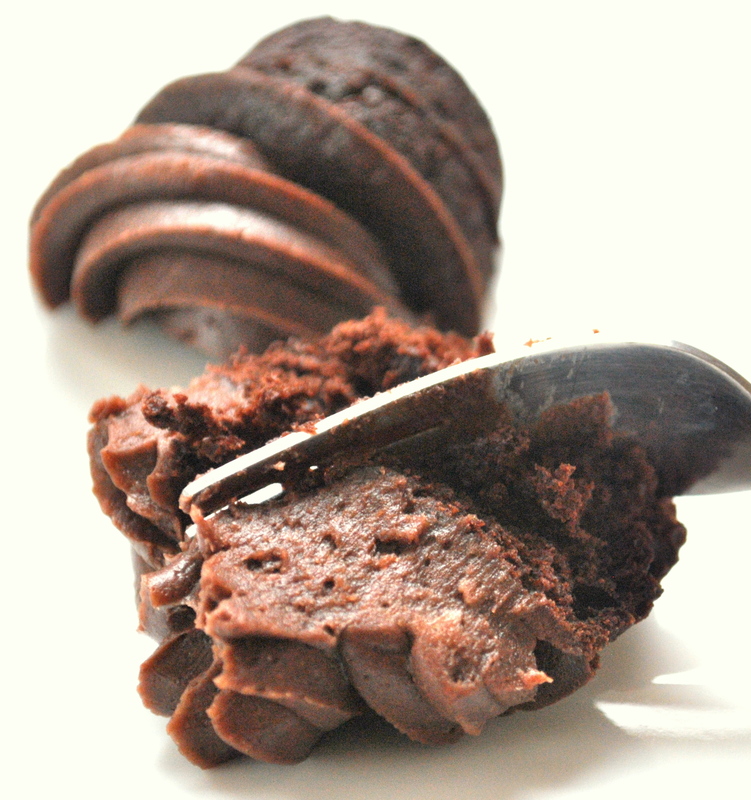 These are rich, moist chocolate cupcakes, rolled into a mouthful of dark chocolate butter cream icing and top with a chocolate whisper. Sitting in a gold and brown tulip wrapper, these are no ordinary cupcakes and are sure to satisfy the expectations of your more than average chocoholic. The rich choclate icing is not too sweet and a mouthful of these followed by a swig of coffee (or a sip of red wine) makes for a perfect dessert in front of the fireplace. 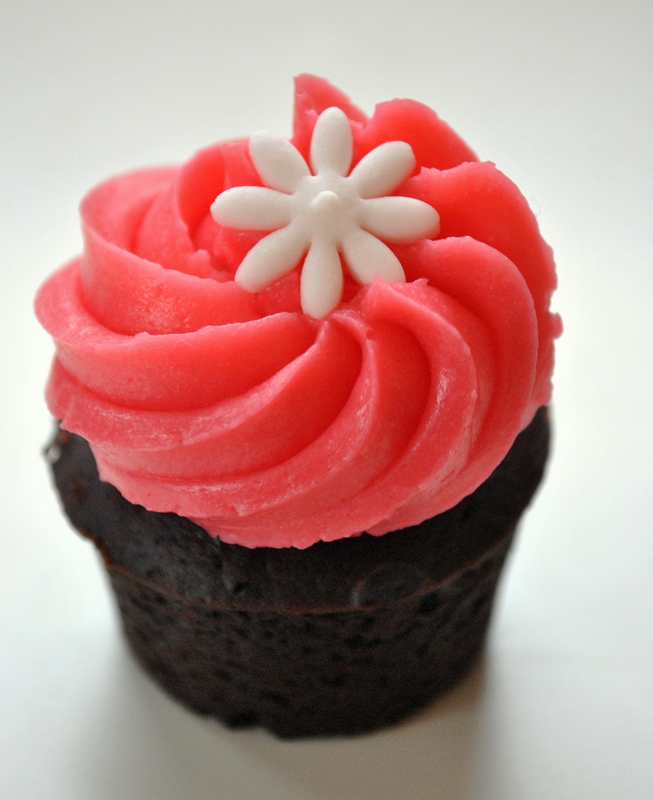 I really like the tulip wrappers – they dress up the cupcakes a bit more and add a hint of elegance. Lovely pastel pink coloured icing swirled over a fresh baked chocolate mini cupcake. These will certainly have you dreaming of Spring, despite the chilly weather and gray skies outside. These are the perfect treat for an afternoon girls tea and are topped off with a pretty white daisy for the final touch up. I finally got round to ordering the Ateco open star icing nozzle and it makes wonders. The giant nozzle needs a specially fitted bag but the lines and style of the icing on the cupcake reminds me of soft serve ice cream as it pours out of the machine and twists on top of your cone. A cup of tea, fresh baked cookies, a blanket and a book. That sounds like the perfect Sunday afternoon in Winter while the crisp white snow is falling outside. Perhaps you could stay I’m stuck in the holiday and Christmas spirit – I’m still baking with cinnamon and spices – and the apartment is filled with these fresh aromas. I got this recipe in a new baking book I was given as a gift. There are so many wonderful and traditional recipes to try. 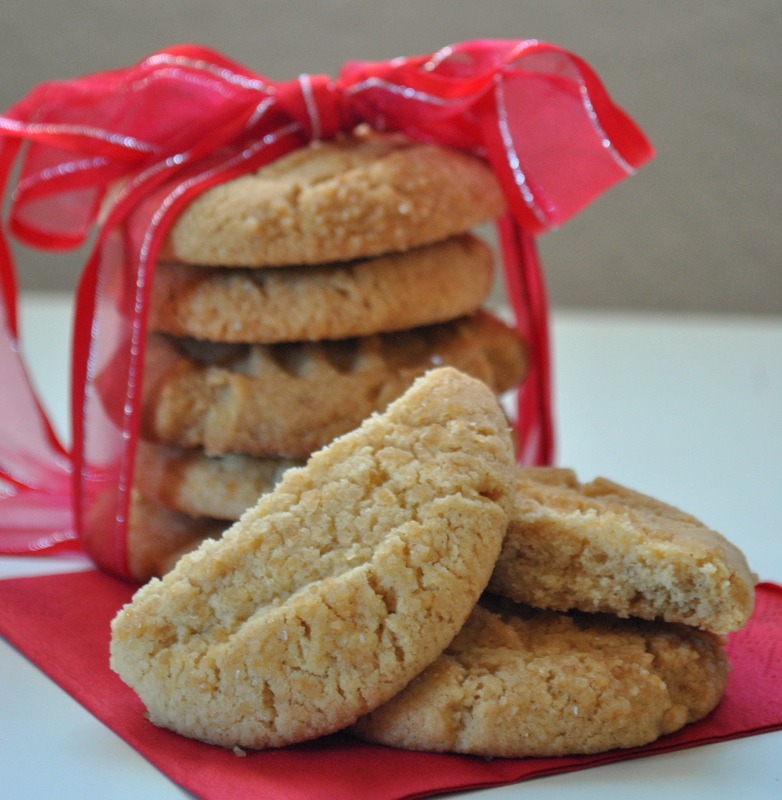 These are butter cookies, similar to shortbread, filled with cinnamon and spice and rolled in brown sugar. Happy New Year everyone! 2013 is off to a fast and busy start but there is always time for baking. This weekend I tried out a new Christmas prezzies I had gotten – a mini cupcake tray. The mini’s are the perfect portion size and so fun to bake with, because the cupcakes are ready after about 15 minutes in the oven. We are back in Germany now, after a great trip to South Africa. 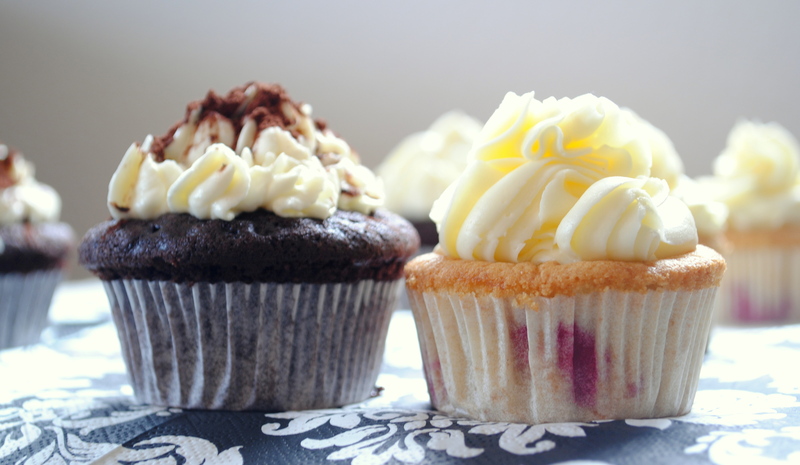 Back to chilly weather and winter days, so I decided to bake cupcakes appropriate for an afternoon indoors. 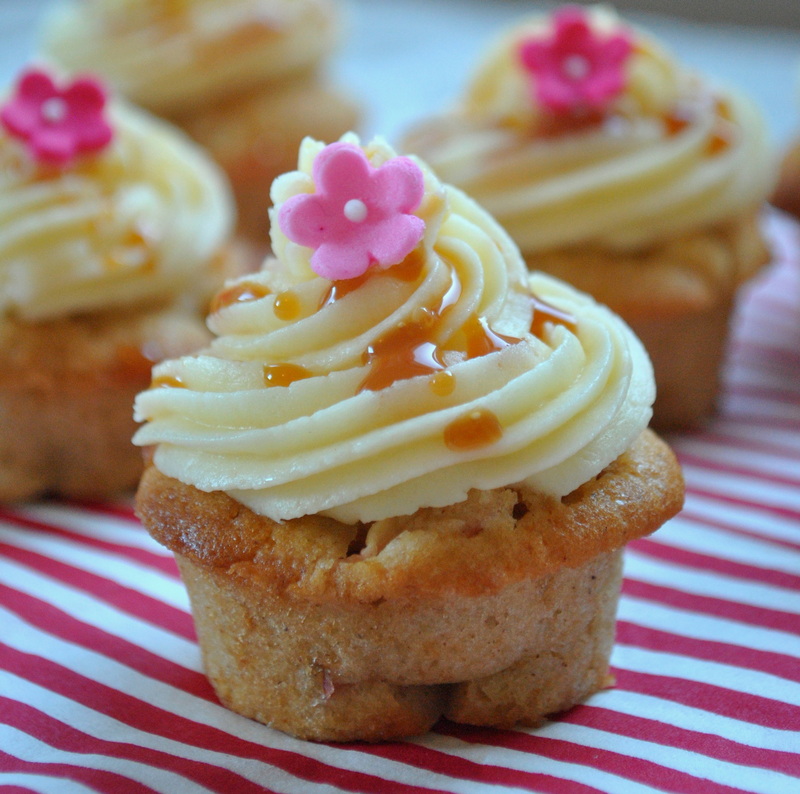 Something like a hot apple pie filled with cinnamon and spices but folded into a mini cupcake. This cupcake is topped off with a light caramel buttercream icing and drizzled with a delicious caramel sauce. I love baking banana bread and had the idea to try banana cupcakes today. I’ve had banana nut muffins before but don’t think I had ever had a banana cupcake before. These definitely ‘taste like more’ and since you know they have a banana in them, you don’t have such a bad mind while you’re munching (or reaching for the second cupcake). The cream cheese icing is delicious. 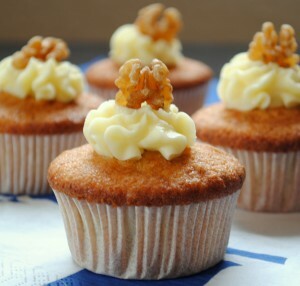 I added a splash of lemon juice as well to the icing mixture as it enhances the flavour and takes off some of the sweetness, and topped itall off with a walnut. So, while these are perhaps a little different to your traditional idea of a cupcake, they go perfectly with that cup of mid morning tea or coffee. No need to have a guilty conscious when that second cupcake wanders over to your plate – a banana is a fruit if I remember right and aren’t your supposed to eat at least 2-3 fruits a day? White choc, raspberry cupcakes with champagne buttercream! These cupcakes are well deserving of the exclamation mark. I have been baking alot the past few days. I don’t think I can keep up with all the washing of the dishes – we need to invest in that dishwasher. In our house, we follow the saying that ‘the chef never washes’ which applies to cooking dinner and hot meals (which is probably why I volunteer to cook most nights). We also, however; have the rule that ‘the baker washes’. So the baker assumes responsibility of washing all baking dishes and cleaning up the mess (Why did I ever agree to that?). It was Christian’s birthday last week, so I wanted to bake something unique and extravagant. I asked him for ideas and he immediately suggested these cupcakes. The white chocolate pairs so great with the raspberries – it is a genius combination. To be honest I have never tasted a chamagne buttercream, and was a little hesitant at first. But it is quite festive and well fitting for a birthday celebration so I decided to give it a go. You have the sweetness from the champagne mixing with the buttercream, sitting on top of the white chocolate, raspberry cake base - AMAZING. I think these are my favourite cupcakes I have baked so far. It is quite time consuming to prepare the cake batter, but definitely worth it. Feast on! These cupcakes are a spin off of Tiramisu cupcakes. You have the same coffee flavour mixing with the cake and marscopone cheese mixed with the whipped cream for the topping, then dusted of course with cocoa powder. Quite frankly: delish! I decided to make the chocolate cake instead of a vanilla because coffee and chocolate pair so well together. The topping is light and fluffy and not overly sweet. I’m really getting into the idea of filling cupcakes in the centre. It makes the cupcake so much more interesting and adds an extra load of deliciousness. Anyone who knows me well enough, knows how much I love chocolate. Yesterday was a public holiday in Germany – Yes that means sleeping in, long walks with our dog in the forest with a flask of coffee, but it also means that I finally had time to bake. I think the title of this article says it all. 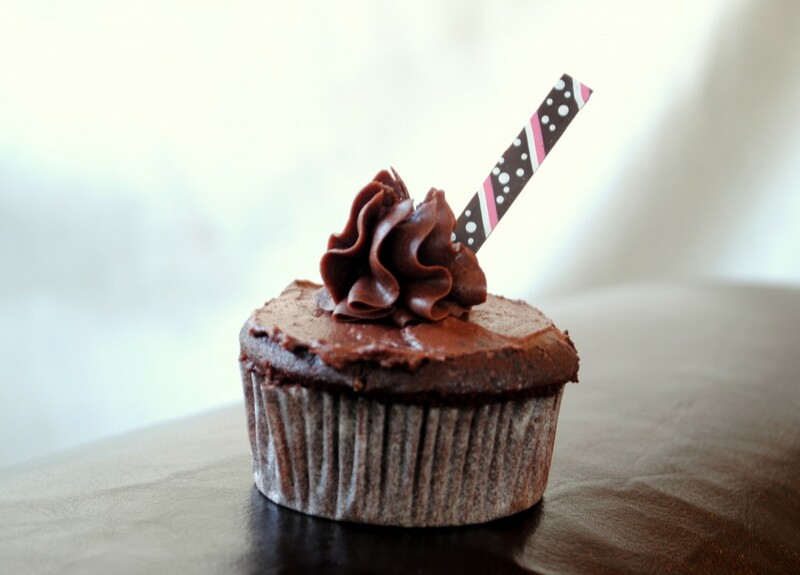 These cupcakes are double chocolate – the cake is a dark, rich chocolate cake, filled with nutella in the centre, and covered in a chocolate buttercream. To narrow down on the calories, I decided just to do a thin layer of icing on top, and then one piping in the middle. The buttercream icing was a good texture, very smooth, and I like how the wavy layers are piped in the middle of the cupcake. The filling is just regular Nutella but the hazlenut flavour paired so well with the chocolate cake and icing. We enjoyed these with a glass of red wine.